Orthotics are a medical grade range of corrective insoles. They are placed in your shoes to correct the alignment of the bones in your feet. To know if you require orthotics you should first arrange an initial diagnostic visit to your chiropodist, who will carry out a biomechanical assessment into the way your foot moves. 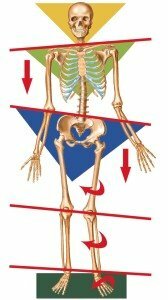 If there are any biomechanical issues, corrective measures can then be taken to counter any problems. Do you suffer from pain in the foot, ankle, knee or hip? This may be solved by wearing orthotics. This is what happens to our body when our feet are off balance. There are lots of different types & brands of generic orthotics/insoles available on the market. You can find them in most pharmacies, shoe shops and even in supermarkets. These insoles offer limited comfort as they are generic and may not solve your issue. We offer 3 types of orthotics, off the shelf, prescription and casted orthotics. Off the shelf orthotics provide extra cushioning and they are designed to give you extra comfort. Prescription orthotics are insoles that are adapted to solve a problem that you have, for example, you may have a dip/groove moulded into the insole if you suffer from a re-occurring corn. Our casted orthotics are custom-made meaning they are made for your feet only and used to correct any bio-mechanical issue that you may have, such as fallen arches. Our orthotics are of the highest quality and made here in Ireland. Orthotics are placed inside your shoe and are invisible to others. They look like normal insoles once they are inside your shoe. You may need to return to visit the chiropodist for regular routine check-ups after your diagnosis. If you are concerned about your feet in any way, or have been putting off sorting out that niggling foot problem, don’t put it off any longer- you can contact us today.